COLUMNA MESSIANIC RESEARCH CENTER: Sabbath 3: DID CHRIST REALLY ABOLISH THE SABBATH? WHAT IS THE TRUTH? There Are Two (2) Weekly Sabbaths Written in The Bible. 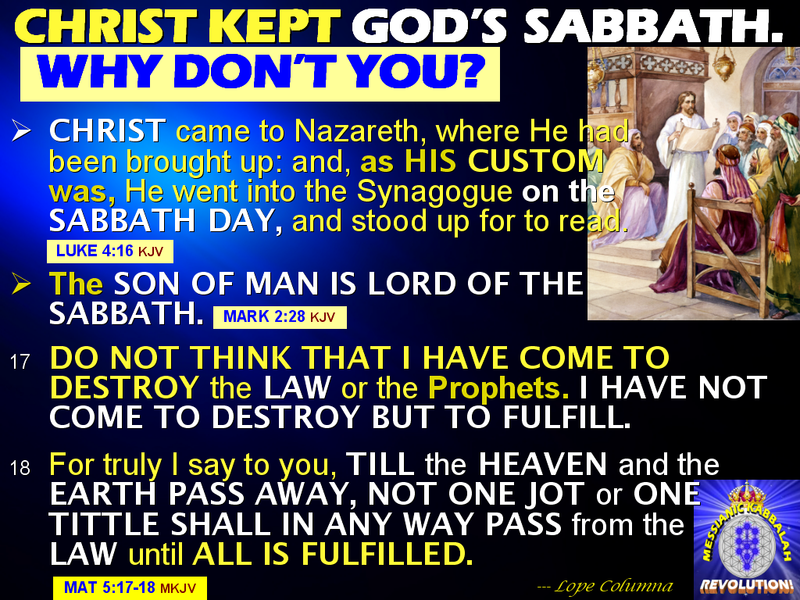 Christ Abolished The Sabbath of The Jews, But NOT THE SABBATH OF THE LORD! Sabbath 3: DID CHRIST REALLY ABOLISH THE SABBATH? WHAT IS THE TRUTH? There Are Two (2) Weekly Sabbaths Written in The Bible. Christ Abolished The Sabbath of The Jews, But NOT THE SABBATH OF THE LORD! The proper observance of the weekly 7th DAY SABBATH (Saturday) is one of the misunderstood and disobeyed commands of God in the Bible. Yes, even the Sabbath-observant Jews have a controversy with Jesus Christ (the LORD of the Sabbath), about its proper observance (Matthew 12:1-2, 10-14)! Today, many Christians, Pastors, Priests, and Churches are deceived to think that Christ abolished the weekly Sabbath by His controversy with the Jews! They don't know that there are 2 weekly Sabbaths: 1) The Sabbath of the LORD. 2) The Sabbath of the Jews. Many Christians and their Pastors are deceived to think that Christ abolished the Sabbath by His controversy with the Jews! They committed this GREAT ERROR because they don't know the Kabbalistic Scriptures and the Power of God (Matthew 22:29). 1. The SABBATH OF THE LORD (Genesis 2:2-3, Exodus 20:10, Leviticus 19:20, 23:3). This is the basic and original SPIRITUAL principle and purpose of the 7th Day Weekly Sabbath as designed and created by God after His creation work of the Physical Universe and everything therein (Genesis 2:2). This original weekly Sabbath use and purpose expanded to the Annual Sabbaths. In other words, the LORD'S SABBATH was made for the benefit of Mankind, that is, to INFUSE SPIRITUAL ENERGY to all of Mankind and God's Physical Creation (Mark 2:27-28). Thus, the Sabbath of the LORD assures the continuous blessed existence of Mankind and the Whole Universe with Holiness, Pure Good, and Eternal Life (Mark 3:4-5, Luke 6:9, Matthew 12:12). This supernal Sabbath of the LORD is taught only by the True Religion of Christ Jesus => The SUPERNAL JUDAISM from the Tree of Life. As the LORD OF THE SABBATH, Christ demonstrated the importance of the supernal Sabbath to Man's Life and continuous sustenance (Mark 2:27-28, Luke 6:1-11)! Ignoring, disobeying, or polluting the LORD'S 7th-Day weekly SABBATH and the Annual Sabbaths resulted to the grievous disasters and curses to Mankind (Exodus 20:24-26)! THE SABBATH OF THE LORD WILL REMAIN FOR EVER AND EVER (Isaiah 66:22-23)! For an in-depth explanation, go to: A SABBATH REST REMAINS FOR THE PEOPLE OF GOD. 2. The SABBATH OF THE JEWS (Leviticus 26:35, John 5:18). The Sabbath of the Jews is the LITERAL and PHYSICAL (EARTHLY) applications of the 7th Day Weekly Sabbath and the Annual Sabbaths. This worldly Sabbath leads to Conflicts, Destruction, and Death; which is the result of the Ministry of Fallen Judaism of the Jews, as well as, that of the Fallen Christianity of Christians (2Cor 3:7). This is the Sabbath that Christ abolished (John 5:15-18). The following Scriptures show the difference between the Sabbath observance of the LORD (Christ) and the Sabbath observance of the Jews. The quoted Scriptures are from the Holman Christian Standard Bible (HCSB). WHAT DAY IS THE 7TH DAY SABBATH? We can clearly see that there is no disagreement between Christ and the Jews about the subject of which Day should the 7th Day Sabbath be observed (Luke 4:16, 31, 6:6, 13:10, Mark 6:2). It is only in the proper applications and the manner of how the weekly Sabbath is to be observed, that there are disagreements. Today, this 7th Day Sabbath corresponds to our Saturday, not Sunday. SUMMARY: Christ abolished the Sabbath of the Jews, NOT THE SABBATH OF THE LORD. Thus, Christ demonstrated the proper way to observe the Sabbath, which is more of the higher Spiritual aspects and dimension (Mark 3:4, Luke 6:9). This is in contrast with how the fallen racial Jews observed their weekly Sabbath, which is more of the literal and physical. Continue on Part 4: CHRIST => The LORD OF THE SABBATH, Rejects Everyone Who Does Not Understand and Observe God's 7th Day Sabbath Command, as He Did! Peter V. Pangilinan WHAT THE SABBATH HAS TO DO WITH OUR SALVATION? Elena Domingo Ummm...thats a very good Question Pastor Peter to answer by Mr god chosen end -time messenger and bible explainer.Lope Calumna..
Lope Columna For the answer, go to: Q477 of The BIBLE EXPLAINER.